Wesleyan University Press, 9780819577429, 184pp. 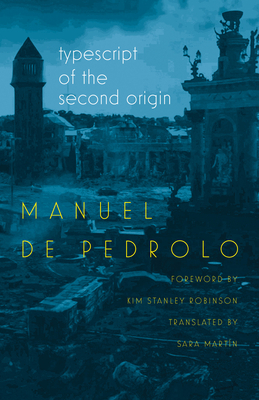 Manuel de Pedrolo's widely acclaimed post-apocalyptic novel, which includes a foreword by Kim Stanley Robinson, tells the story of two children who survive the brutal destruction of Earth by alien explorers. The protagonists, Alba and D dac, retreat to the forest, then journey to the rubble of Barcelona to rescue and preserve the remnants of human civilization in the city's bombed libraries and cultural institutions. In the absence of the rule of law and social norms, the children create a utopian world of two that honors knowledge and interracial love, to become a new Adam and Eve and try to bring about the world's second origin. A bestseller and required reading for secondary school students in Catalonia, Typescript of the Second Origin is indispensable to understand how a region of Spain whose language, culture, and institutions were targeted and punished by Francisco Franco. At the same time, Pedrolo's tale of survival reaches beyond national and cultural borders to offer contemporary international readers a timely warning about the threat of global ecological destruction.